What are the most volatile major pairs and what are the most volatile exotics pairs with tight spreads? The most volatile major pair I can think of is EUR/USD. Then there are GBP/USD and USD/JPY. EUR/USD has the tightest spread of all pairs, at least in my experience. Apart from EUR/USD, EUR/JPY, GBP/USD also have tight spreads and are pretty volatile. USD/CHF is very volatile, if one dares to trade that. I don’t. The major pairs are composed with EUR, USD, JPY, GBP. 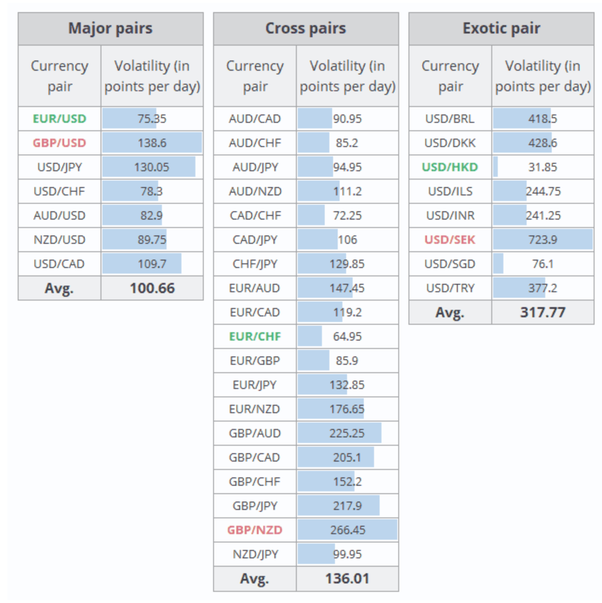 The Most Volatile Currency Pairs – TableThe table shows that today the most volatile Forex pairs are exotic ones. Namely, USD/SEK, USD/BRL, and USD/DKK. All of them move for more than 400 points per day on average. EUR/CHF, CAD/CHF, AUD/CHF and EUR/GBP differ like less volatility fx pairs among the cross rates. The amplitude of their movements doesn’t exceed 90 points per day. You may conclude on the basis of such statements that trading in exotic currency pairs or cross rates promises large profits. However, it isn’t quite so simple. Indeed, the range of exotic pairs’ movements is much broader than that of the major ones. However, such a high volatility is a result of low liquidity, and trading in illiquid currency pairs carries particular risks for a trader. According to me, Gold & GBPJPY. By the way, volatile trading pairs are more risky so take enough preparations before the live trading. Yep, I can confirm that majors like EUR/USD, USD/JPY, GBP/USD are the most volatile with the tightest spread. EUR/GBP and EUR/JPY are volatile as well but here the spread is a bit higher. As for the exotics, I usually prefer to stay away because to be honest I find them a bit riskier most of the time.